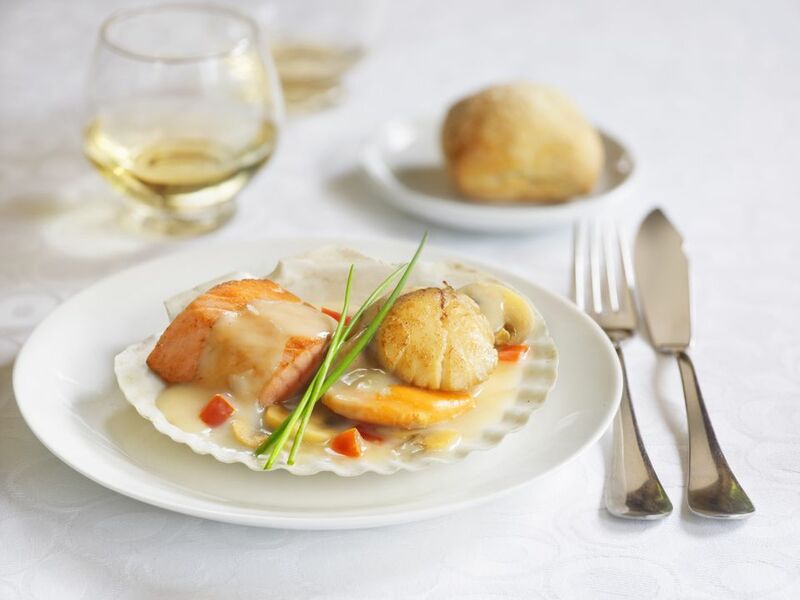 Scallops, or Coquilles Saint Jacques as they are known in France, are so quick and easy to prepare, but they are also easy to ruin if not cooked carefully as they quickly overcook. In this traditional French recipe, they are served with a luscious sage sauce. This scallops in a sage cream recipe are astoundingly quick and easy to prepare. Sweet, pan-seared sea scallops are nestled on a bed of sautéed mirepoix and sage cream. With its fresh, simple flavors, this dish will appeal to seafood lovers, and it makes an excellent last-minute dinner but remember to cook precisely as stated in the recipe. Before starting, it is important that you have prepared all your ingredients ready to cook. If you do this then cooking the dish will be so much easier and will also be successful. Preheat a large skillet over medium heat. Heat the oil and the butter in the skillet take care not to burn them. Add the carrots, celery, and onions to the skillet, lower the heat to medium-low, and sauté the mirepoix for five minutes, or until the vegetables turn tender but not soft. Transfer the sautéed mirepoix to a plate and cover it with foil. Preheat a large skillet over medium heat. Heat the oil and the butter in the skillet. Add the carrots, celery, and onions to the skillet, lower the heat to medium-low, and sauté the mirepoix for five minutes, until the vegetables turn tender. Transfer the sautéed mirepoix to a plate and cover it with foil. Turn up the heat to medium-high. Season the scallops with salt and black pepper and sauté them in the skillet for 1 1/2 minutes on each side, no more, no less. Transfer the pan-seared scallops to a plate and cover them with foil. Sauté the shallots in the skillet for 4 minutes; add 1 teaspoon of butter, if needed. Add the heavy cream to the shallots and bring the sauce to a boil for 1 minute. Remove the cream sauce from the heat and stir in the sage leaves. Leave to infuse for a few minutes, then remove the leaves. Drizzle the sage cream on a warm serving plate, spoon a small mound of mirepoix onto the center of the plate, and arrange a few scallops on top of the mirepoix.